Shakill is a Fellow Chartered Accountant and also hold a post graduate certificate in Finance (MBA) from Heriot Watt University, UK. He is well versed in financial and operations management, accounting, internal controls and risk management. 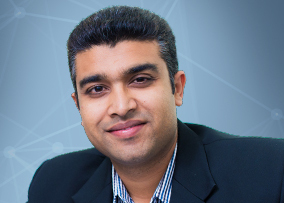 After graduated as a Chartered Accountant in 2001, Shakill joined Ernst & Young Mauritius. Between 2006 and 2010, he worked for Deloitte Mauritius as Manager. After gained several years of experience in practice, he moved to industry as Group Financial Controller in Rey & Lenferna, Ltd. Prior to joining Amicorp, Shakill was the Finance and Administrative Director in Stag Beverages Ltd. (Castel Group of Companies). Shakill is the chairman of the Board of Change Express Ltd. a foreign exchange company. He also lectures in various business schools as a part time lecturer. Shakill speaks English, French and some Hindi. His family includes a daughter and a son. In his spare time, he enjoys swimming and spending time with family.